My favorite tarot deck is Robert Place's gorgeous and glorious Alchemical Tarot. It uses - you guessed it - alchemical symbolism, and is lovingly rendered in Place's signature graphic style. Colorful, unusual, image dense, it's truly the stuff of dreams. "Donate $30 and you'll get an 8.5” by 11” signed archival gyclee print of your choice of one of The Alchemical Tarot illustrations. Donate $40 and you'll receive a signed copy of The Alchemical Tarot. Donate $65 and you'll receive both the print and the signed copy of the deck. Donate $120 and you'll receive the print, the deck, and a signed copy of the companion book when it is complete. Donate $200 and you will receive the print, the deck, and a signed copy of the companion book, plus I will give you a one-hour Tarot reading with the deck over the phone or in person in Saugerties. Donate $700 and you will receive the print, the deck, and a signed copy of the companion book, plus you can come to my house for a five-hour personal class on using The Alchemical Tarot." Sounds like a great deal to me. More info here. Statement: For me, alchemical model is not antiquated and is much needed in our time. In alchemy, the shadow, our dark partner we project onto others, must be acknowledged and integrated. The pairs of opposites are brought together and transformed into a new third element. In our age of black and white thinking, with the shadow projected onto the Arab and others, this model provides a welcome change. Alchemy has to do with transformation, transmutation, and changes in the inner life which become manifest in the outer world. Without the transformation of the individual, there can be no transformation in the collective. 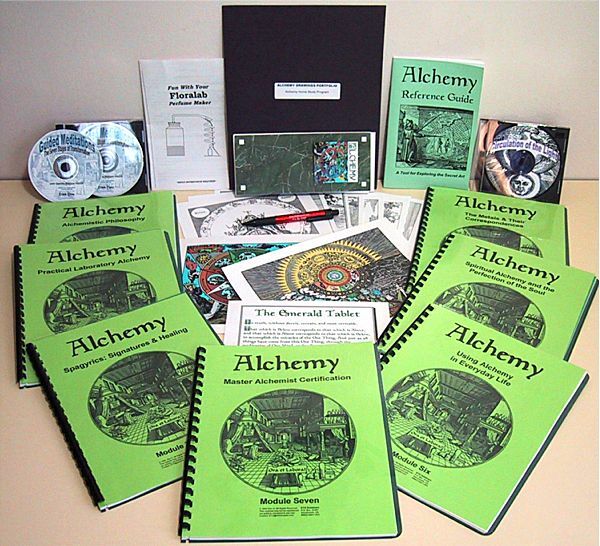 Alchemy connects the inner transformation process through fantasy to the outer world. Just marvelous. Hmmm, maybe I need to arrange a leaf peeping, alchemical Vermont excursion. Oh my goodness. Can it be true? The first ever International Alchemy Conference in Vegas!!! "Largest Gathering of Alchemists in 500 Years!
. . . and much more!"